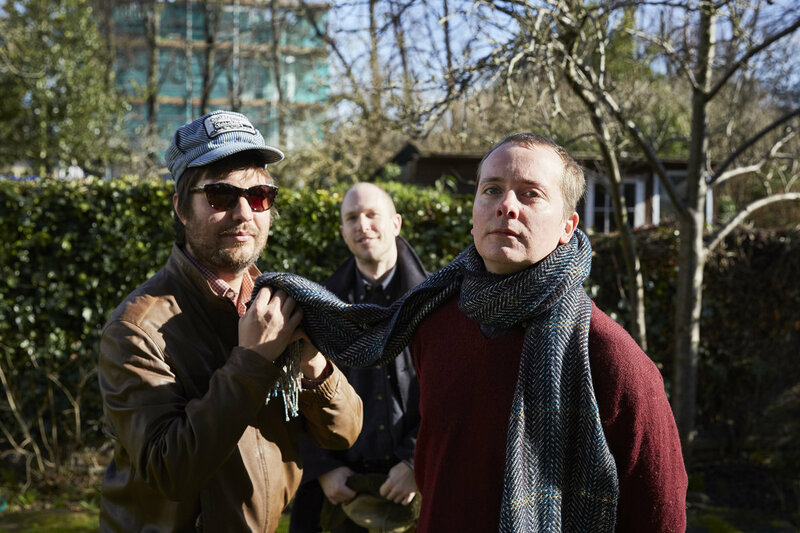 Tonight The Wave Pictures pull off a rare feat. Without introduction the four piece take to the stage and launch straight into their opening number which begins with a solid minute of vocals accompanied only by David Tattersall’s gentle and deliberate flashes of guitar. Usually this would result in thirty seconds of music drowned in conversation followed by another thirty of gradual realisation and relative quiet descending over the room. The scenario tonight is an altogether different affair. As soon as the opening line comes out of Tattersall’s mouth the audience is almost instantly silent and watch on in a respectful reverie for a band that are clearly very dear to a large portion of them. This sets the tone for the rest of tonight’s entertainment where the band are self-confessedly buoyed up by the affectionate response of the crowd. Observing from the back of the Soup Kitchen’s studied grottiness that is the basement, tonight showcases a version of The Wave Pictures located in their blues and country roots, playing a number of up-tempo songs that I haven’t heard make an appearance in my previous experiences of their live show. The set runs for about an hour and thirty minutes with encore but it is largely a fast paced affair and keeps one’s attention easily. This could be down to a setlist drawn from almost all of their extensive back catalogue, satisfying both the purists for reasons of comprehensiveness and the causal listeners for its pace. When Jonny Helm swaps his drums for vocal duties to sing ‘Sleepy Eye’, Tattersall announces that this, their first song, turned 21 years old this week which accounts for the sheer volume of material they have amassed up to this point. For a band that have been in existence for over two decades it is still somewhat confusing to me that they continue to play in mid-capacity venues such as the Soup Kitchen and Deaf Institute but this is also a significant positive. It is in these spaces that songs of such a lyrically personal nature work best and the contained sweatiness of tonight’s venue hems in the gusty blues riffs and solos that are a frequent fixture in The Wave Pictures’ tunes. It’s clear that commercial success is the least of the band’s concerns as summed up by Helm’s plug for their merch stand which runs along the lines of, “that last song was taken from our vinyl only release A Season in Hull which we have for sale at the back so… make of that what you will.” You need read only this sentence to gain an idea of the band’s modus operandi in terms of their marketable aspirations. Having released numerous records on their own label Wymeswold Records it would seem obvious that a love of their trade is what keeps The Wave Pictures putting out material at a speed that would give The Fall and King Gizzard a run for their money. Tattersall’s lyrics are often, to me at least, impenetrable and cryptic, but that doesn’t stop a large number of the crowd joining in with him throughout the set. Franic Rozycki plays his usual role of studied cool on bass not unlike John B. Sparks from Dr Feelgood, a crucial musical touchstone for the band evidenced by their 2017 tribute EP Canvey Island Baby, whose title track is given an outing tonight. They also provide a gloriously country-inflected cover of Daniel Johnston’s 51 second throwaway ‘Hoping’ which the band manage to convert into a country wig-out complemented by some enthusiastic dancing from Helm. Latest release Look Inside Your Heart also contributes a number of tracks to the set which mark what I see as their strongest release since Great Big Flamingo Burning Moon in 2014. The crunchy guitar driven ‘Pea Green Coat’ is the song plucked from that album, an upbeat 3 minute pop tune which is a perfect complement to other songs that exist around it. ‘Remains’, a tribute to Charles Bukowski, is thrown in alongside ‘The Woods’ from City Forgiveness and ‘Friday Night in Loughborough’ from Instant Coffee Baby. There are slower moments such as ‘Just Like a Drummer’ but these serve to punctuate a night where the band are in the business of lightning fast solos and all that goes with them. When it comes to this aspect of the show we are spoilt for choice with 2 bass solos, 3 drum solos and simply too many to count from lead man Tattersall. 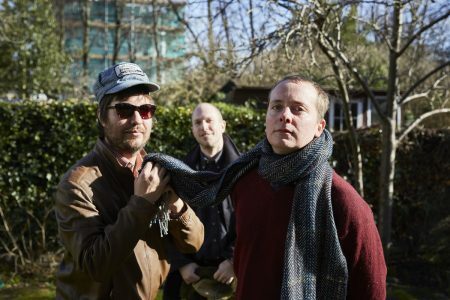 The Wave Pictures seem to operate in two distinct registers, one being introspective melancholy pop songs with the other being much more carefree, optimistic blues rock. Tonight’s show sees them very much in their latter iteration . Tattersall’s comments about the contrast between tonight’s smiling Mancunian audience and Birmingham’s more solemn crowd are a relatively safe bet to get a cheer but he is clearly in earnest when he says that the crowd’s reaction has been paramount to the show this evening. The variety of requests for their encore and the fact that the show was a sell-out suggest that this audience involvement was a sure thing from the start. When the encore is finally decided upon and the band whip through ‘Stay Here and Take Care of the Chickens,’ the call and response singalong it provokes is a perfect summation of an evening where the unspoken agreement between artist and audience has been well and truly honoured. Gigs like these are a reminder that the interaction between viewer and artist is crucial to any live experience and that a little effort on both sides can go a long way to maintaining the value of seeing an artist practice their craft live. The fact that The Wave Pictures can take a bow as the applause rings out at tonight’s finale says a lot for the respect both band and audience have for each other.